DUSHANBE (TajikTTA) — Tajik President Emomali Rahmon and Dushanbe mayor Rustam Emomali took part in the opening ceremony of the non-state educational institution World Cambridge Academy, today, in the Shohmansur metropolitan area. 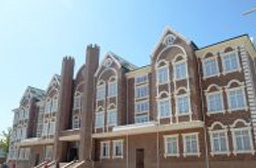 The construction of this Tajik-British educational institution was started in April 2017. The Academy in Dushanbe consists of two 3-storey buildings with a basement and one 2-storey building, representing a floor area of 6,847 m². The school has created conditions for the education and upbringing of 500 children of preschool and school age. The Academy also has a dining room, a medical centre, a library, and facilities for preschool and school education. Training at the Cambridge Academy will be conducted according to the curricula of preschool and general education, based on the state educational standards of Great Britain and Tajikistan. The language of instruction is English. Graduates of the Cambridge School will be issued with documents on obtaining a state education of Great Britain and Tajikistan, which will allow them to continue their studies in universities in Europe, the United States and Japan. The best teachers of Tajikistan and Great Britain are invited to work in the academy. Until 2020 in Dushanbe, it is planned to build a college for students aged 18 to 23 years. Good Day, I am Anora Kosimova from Dushanbe. But actually I am in Turkey because of university. And I am gonna graduat so soon at the end of this month. I want to send you my CV but I could not find the way to send it. So I am writing here. My department Biomedical Engineering. I want and desire to work with great pleasure here that will be an honour for me.